One of the most striking conclusions of Albert Einstein's theory of general relativity is that the trajectory of light curves in the presence of matter. This effect can be observed in the case of light emitted by a distant galaxy, when its light passes close to another galaxy on its way to the observer. The phenomenon is known as gravitational lensing, because it is comparable to the deviation of light rays by the classic glass lenses. Similarly, gravitational lenses act like magnifying glasses that change the size, shape, and intensity of the image of the distant object. Depending on the degree of alignment of the two sources, multiple images of the distant source can be observed, such as four separate images in the form of a cross (hence the name "Einstein's cross"), rings, or arcs. It is in general extremely difficult to spot a gravitational lens, because the separation between the images produced by the lens is usually very small, requiring high-resolution images to see them. It was precisely analyzing Hubble Space Telescope high-resolution images that it was possible to locate an asterism that looked like a new example of Einstein cross. However, spotting four points of light in the shape of a cross positioned around a galaxy does not assure us that it is a lens, so we must show that the 4 images belong to the same object. To do this spectroscopic observations are needed. For this reason, a team of Italian scientists led by Daniela Bettoni of the Padova Observatory and Riccardo Scarpa of the IAC, decided to observe spectroscopically with GTC the supposed lens. According to Scarpa, "the result could not have been better. The atmosphere was very clean and with minimum turbulence (seeing), which allowed us to clearly separate the emission of three of the four images. 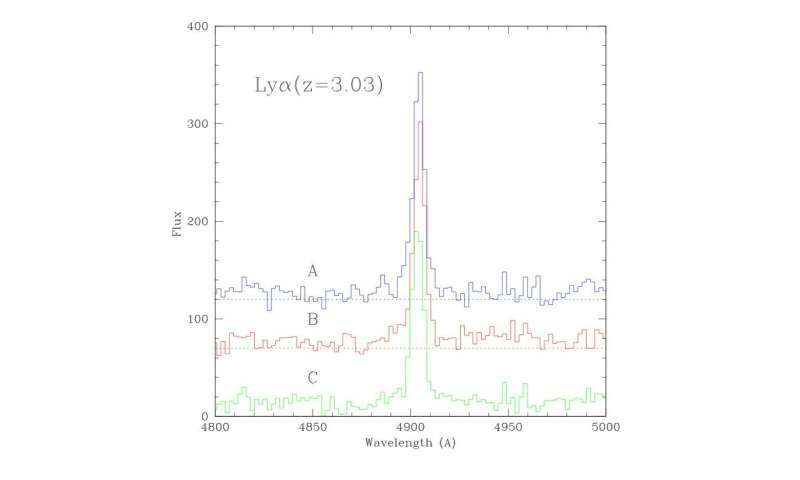 The spectrum immediately gave us the answer we were looking for, the same emission line due to ionized hydrogen appeared in all three spectra at the same wavelength. There could be no doubt that it was actually the same source of light". Thanks to these new observations, presented in The Astrophysical Journal, astronomers now have one more tool to investigate the Universe. Gravitational lenses are important because they allow the study of the Universe in a unique way. Because the light of the different images, initially the same light, follows different paths in the Universe, thus any spectral differences must be due to the material that is between us and the source. Moreover, if the source is variable, we can see a time delay (one image illuminates before the others), which provides valuable information about the shape of the Universe. Of course, the mass of the lens responsible for bending the light can be accurately derived, providing an important independent method to weight galaxies. Finally, as with a normal glass lens, the gravitational lens concentrates toward us the light from the source, making it possible to see intrinsically unreachable objects. In this case it could be calculated that the source is 5 times brighter than it would be without the lens. I'm pretty sure we can't see anything that's 20,000 million light years away. No Einstein cross as described but highly more likely a family of objects being ejected by the central feature as described by Halton Arp. If you're "pretty sure" then you must have done the math. So let's see it. Or is "pretty sure" just your euphemism for "I'm dumb and lazy and just want to voice a gut feeling"? Arp was wrong. The cross showed him to be talking crap. As to how we can see objects more than 13.82 billion light years away in a universe only 13.82 billion years old, you have to consider the expansion of the universe. Isn't the center image supposed to be dimmer than the other four in an Einstein Cross? I haven't found ECross images in which center image has strikingly different color than the surrounding ones. I need to explore more I guess. The central object is the foreground galaxy doing the lensing, the four blue objects are the background lensed galaxy. In some ring configurations you do get a faint central image of the source but not in Einstein crosses (as far as I'm aware). I think you have to be right, @IMP, since the (now both of the) Einstein crosses I'm aware of have a galaxy right in the middle that would preclude seeing the much dimmer one behind it. The source is at least 20 billion light years away (z = 3.03). Well, I don't know about you. But I for one, intend to start using the term "Einstein's Cross as often as possible! Knowing how much it will infuriate the bigots & other bad examples of primitive sanguinary religious beliefs. Gonna be up there with Black Holes & Dark Matter/Energy in triggering the looneyticks infantile racist tantrums. I'd say the best part is? That Humanity is slowly civilizing to the point where we didn't have to nail the Good Doctor to that cross as happened to Doctor King. Yeah, I'm going to have to reconsider how civilized we actually are? We've all seen optical lenses that magnify or reduce the apparent size of an object, but I don't believe I've ever seen a single lens that splits an object into four distinct images. 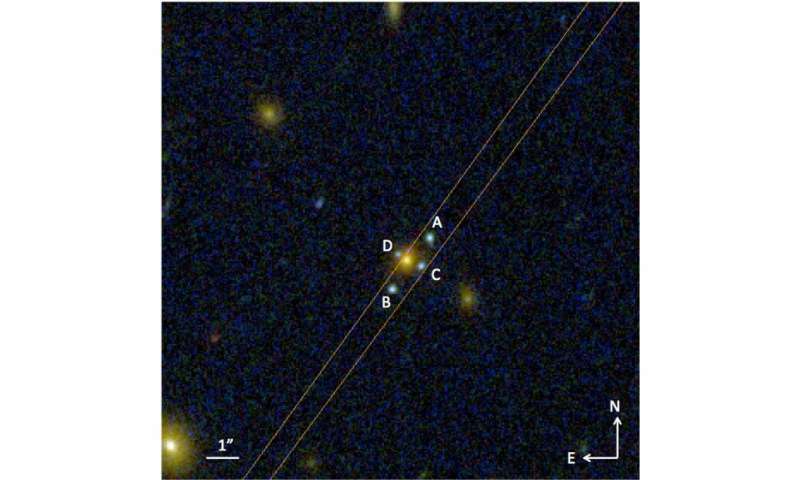 How and why would a gravitational lens do that? Lol, any optical phenomena is attributed to the demi god of science, Einstein. I'm so glad we have people around who are so much smarter and more intelligent than the rest of the scientific community, combined. Truth to tell, I'd bet my house you're suffering from the Galileo Fallacy. Physics has nothing to do with salaries; it has everything to do with measurements, mathematics, and the scientific method. Because no one will pay for it. Savvy has accomplished what nobody else has ever managed to do in the history of science. He has used an experimental setup consisting of a "standard flooring tile" (you know, the type you can only get at great expense from scientific equipment suppliers) at two positions separated vertically by 35 feet, and measured the red, green and blue components of the sunlight reflected by the tile, using a smartphone app. the Sunlight Spectra is Blue Shifted at the Higher Location, as compared to the Spectra at the Lower Location, Which proves that Time is Dilated at the Higher Location, where the Gravity is lower, as compared to the Lower Location. Who would not be convinced by this paradigm-shifting conclusion??? I'm rushing to sell my shares in Einstein Inc. as soon as the stock exchange opens, and I'd advise you to do the same! which negates gravity, and note a slight anomaly in your graph. I'm not sure whether it's an oversight, or whether there is new science just waiting to be discovered, hidden in "plain sight", but I note that the upper of the two lines in your graph is definitely REDDER than the lower, which is BLUER! - this is in stark contrast to the conclusions you draw in your experimental setup as I have described them above, and in which you have proved that the higher an object in the gravitational field, the more blue-shifted it is. People - check out @savvy's Youtube video where his Vrillectric Antigravity Machine "The Ark" is presented actually working in real time - https://www.youtu...g68VE-Ys - "ENGINEERING THE SPACE TIME METRIC - VIMANA". Especially keep your eyes on the clock-gauge and the candles, which show clear evidence of the machine rising, and also of time-dilation. Garfield and Kitty are also featured as independent observers. Great work, Sir! - I look forward to travelling in comfort to Mars and beyond in a Vrillectric Ark-powered spacecraft!!! We've all seen optical lenses that magnify or reduce the apparent size of an object, but I don't believe I've ever seen a single lens that splits an object into four distinct images. Because lenses that you usually encounter in optical setups bend light more the further away from the center it passes through the lens. Gravity, on the other hand, bends light more the *closer* it passes to the center of the mass that is bending it. This means an optical lens has a focal point whereas a (radially symmetric) gravity lens has a focal line. Apparently you can get the effect with an optical axicon lens. With a nonuniform axicon lens you could also potentially create an Einstein cross-like image optically. Thanks for that answer AP. I had the same question.